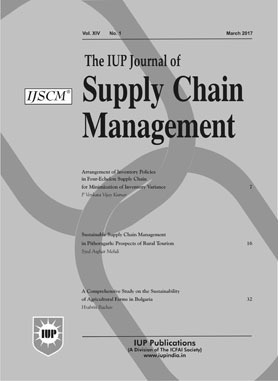 It is a quarterly journal that focuses on Purchasing, Manufacturing, 3PL, E-procurement, Reverse supply chain inventory, Warehousing, Planning and forecasting, Collaborative commerce, Data analytics, E-supply chains, Risk management and sustainability of supply chains, Value chain management, etc. While numerous new distribution channels have emerged in recent years, the challenge for today's large retailers is to develop effective omni-channel strategies. This paper, based on an analysis of 26 large retailers, explores the omni-channel strategies being followed by French retail brands. The analysis reveals an original typology of four ideal-types of strategies: the delivery omni-channel strategy, the logistics omni-channel strategy, the experiential omni-channel strategy, and the relational omni-channel strategy. The typology contributes to the emerging omni-channel literature, and feeds into the reflection on how the relationship between the large retailer and the customer is constructed. Bangladesh is one of the most vulnerable countries in the world adversely affected by climate change. Climate change is now hindering the subsistence of the coastal communities by posing severe threats to agricultural sector and food security. This study analyzes the value chain of vegetables in the coastal area of Bangladesh to combat climate change through adaptation approaches. The authors found that profitability of growing vegetables is much higher than traditional crops in the study areas. In most places, the end market of vegetables is small and is not linked to the national market. Almost all the vegetables produced in the region are consumed locally, and there is a gap in supply, which is filled in by vegetables imported from outside market. Marginal farmers tend to consume around 50% of their produce and large farmers consume up to 5% of their produce. They both tend to sell the vegetables to local retailers which are bought by local consumers. Vegetables imported into these regions tend to be the ones which have very high market demand. The study illustrates that all stakeholders of the value chain should concentrate on competitiveness and productivity and look for and exploit multiple ways to add value once initial success has been attained with a single deal. Strong private sector alliance, along with public-private ventures, is needed for ensuring sustainability within the agriculture products value chain for climate change adaptation for the climate hotspot in Bangladesh. Compared to the research efforts aimed at identifying the leading causes and impact of the bullwhip effect on supply chains, efforts to stem its existence have been relatively scarce. In this paper, the authors suggest an innovative artificial intelligence approach that may be applied to any stage in the supply chain. The study exploits previous research efforts, uses historical data, and applies the product life cycle concept to the modeling process.